South Korean director/writer Na Hong-jin who made his impressive debut feature “The Chaser” and the globally acclaimed The Yellow Sea, has smashed box office records with his new film, a tense supernatural film called The Wailing. American horror/ghost movies seem to go for the jump in your seat moments with silly unbelievable scenarios. It's worth it to take a chance on a subtitled movie to appreciate the build up that surprises the viewer while preparing your mind for future nightmares. It's unsettling, creepy, and there's unexpected moments of humor. The movie is two and half hours, but you will not notice it.. The first thing you notice in this movie is the incredible scenery which took six months to crisscross South Korea for those perfect shots. Obsessive detail lead to an exhaustive search for the traditional Korean homes, roads, hill sides, down to the curvature of the trees. 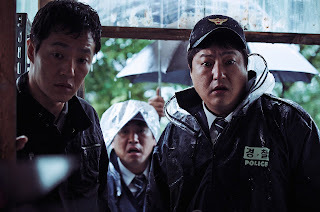 In the small rural village, Jong-gu (Kwak Do-won of The Attorney) is a police Sergeant who along with his partner are constantly being berated by their commanding officer for being late, or not washing the car right. Jong-gu gets a call in the early morning hours as a murder occurred by the local ginseng farmer who slaughtered his wife and another man. The police are quick to declare it a crime of passion and that the accused may have been under the influence of bad mushrooms. Jong-gu is a bit of a bumbling, incompetent cop who usually runs at the first sign of danger. As more murders occur, Jong-gu is having these bizarre dreams involving the appearance of a Japanese hermit which rumors says is the source of the bad things happening in the village. It gets even more strange when the herb and tonic man sees a half naked man in the woods eating a deer raw like an animal. Things really heat up, when Jong-na's daughter becomes ill. His mother-in-law asks him to contact a shaman (Hwang Jung-min) when the hospitals can't find a source of her malady. The ceremonies to expel the evil from the girl is more entertaining and fascinating that Exorcist spinning head and pea soup. The Catholic Church in this story tells him the church cannot help him. There are lots of red herring and a mysterious woman in white (Chun Woo-hee), not a lot of answers. The tension and desperation of Jong-ju to find a cure for his daughter leads the normally cowardly man to make good on his promise to his daughter that he's a policeman and everything will be all right. The film opens in Dallas at he Cine Oasis in Carrollton. You really don't want to miss it.